Have you ever seen those reality shows like “Clean House” and “Clean Sweep” where they go to the homes of people who are pack rats – people who can’t control themselves and have to keep practically everything they’ve ever acquired in their lives? 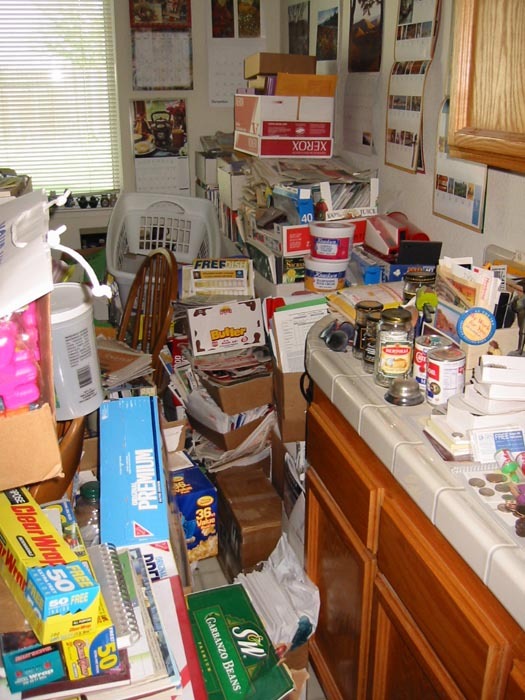 “Pack Rat” is a term worth considering for some people when it comes to presenting information. I was recently contacted by a person on behalf of a scientist who was looking for suggestions on how to improve his public presentations. I took one look at his PowerPoint slides and that was all I could think to say — “this guy is an information pack rat.” He had about 50 slides for a single talk and almost every one of them had more than just a few pieces of information — they were entire paragraphs filled with facts and numbers. I felt my knees buckle and had to grab a chair as I looked over the slides and wondered whether there really are audiences who will sit through so much information. But the term “information pack rat” is actually very appropriate and applies to most scientists — myself included. I still, to this day, have a hard time shrinking down my talks to an appropriate number of slides. It’s a terrible problem. And I do it when I’m telling stories, too, as I confessed in chapter 3 of the book. There’s something in the mind of a scientist that skips over the idea of “less is more,” and goes right to “more is more.” Is more. Is more. Is really more. Let me tell you of an experience at the other end of the information burden spectrum that brought this dynamic home. It’s been a busy spring at Prairie Starfish Productions with screenings, talks, panels and workshops. One of the most interesting moments came in mid-April when my producer, Ty Carlisle, and I went to Catalina Island for a week to run one of our intensive videomaking workshops with the Environmental Studies undergraduates. By the end of the workshop we had witnessed something rather mind bending. After running these exercises for five years with science graduate students, this was the first time he and I did one with undergraduate non-science majors. Guess what — their concepts and films were better than the work of graduate students. By quite a bit. Not all of them. Some of the pitches were no better than what we get in most classes. But the other half were pretty impressive. And the finished products, which as always can only be so good given the limitations of a few days, were still better than what we’re accustomed to with grad students. Why was this? Wouldn’t you think that older, more educated students would do a better job with making videos? It took us a week of thinking and discussion to process it, but our feeling was that this occurance was due to two factors. First, the undergraduates are clearly more fluent in the language of film and television — particularly these being mostly non-science students (they were environmental studies majors). One thing you hear a lot from science grad students is that they don’t even own a television and rarely go to the movies. In contrast, the undergrads blabbered constantly about their favorite TV programs and movies. It showed in their videos — one was a parody of the show “Intervention” (the faculty had never heard of the show), another was a solidly conceived horror movie, a third was lifted from MTV music videos. We don’t see that sort of television and movie fluency in grad students (though I have a feeling most grad students are happy that their brains aren’t clogged by that much TV garbage). The second factor is probably that grad students are a group who have been selected already based on their analytical skills and tendencies. Film is a more intuitive medium. The undergrads were a more intuitive group, far less analytical (as confirmed by their partying stories we listened to). And the ultimate example of the power of intuition in filmmaking came in the form of the best video of the group. Of the five videos made by the undergrads, one stood out — not just from this group, but from every other group of students we’ve run this exercise with. The guy who pitched the concept had been nicknamed “Scottie the Hottie” by all the girls in the class. He was your average non-science major happy kid, and his vision for the video was crystal clear from the outset. Very simple — one long visually interesting shot paid off by a short environmental message. Think about this structure. Instead of having the usual 15 second “hook” at the start of a video followed by 45 seconds of “message” (= fulfillment), this guy reversed it. His video had 45 seconds of arousal, capped off by 15 seconds of fulfillment. And it worked. When we showed the final cuts of the videos, his was the only video that the students and faculty asked to see a second time. In fact, we’ve never even seen a request for a repeat viewing of a video in these workshops. It was novel. It’s not a masterpiece — how much can you expect of a video made by students with no videomaking experience and given only a day to make it. Also, the backwards shot is lifted straight from countless music videos. But conceptually, it’s pretty effective. And I think it’s a role model for all the information pack rats in terms of how to make use of the medium of film and video. Film is not a medium for all your graphs and data (eh hem, would someone please remind Mr. Gore of this), or to make every single point on a subject. As Jeremy Rowley said in February on The Benshi, it’s about picking one or two things that you have to say and doing a really good, memorable job with them, rather than presenting a dozen points poorly that nobody remembers. Film is more powerful on the arousal side, as a tool to motivate people to take a deeper interest in a subject (rather than motivating them to run for the exits when the film is over). Academics have a tendency to think, “We need to work with the smartest filmmakers,” and are impressed when they talk with a filmmaker who is an intellectual and speaks the same language as they. But if you really want to reach the broadest audience, you’re probably better off with the less cerebral, more artistics types like Scottie. I know this probably seems counter-intuitive to academics. What can I say. Sorry. It’s what my book is about.